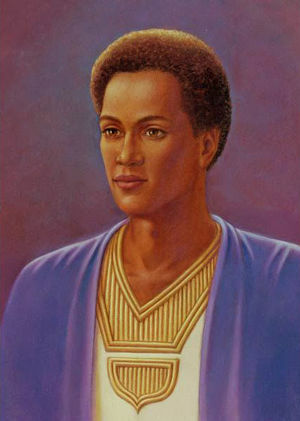 Afra was the first member of the black race to make his ascension. Long ago, he offered name and fame to God to sponsor a vast continent and a mighty people. When he ascended, he asked to be called simply “a brother” (frater in Latin), hence the name Afra. The continent of Africa takes its name from Afra, and he is the patron of Africa and of the black race. There were ancient golden ages in Africa when it was a part of the continent of Lemuria, when the people came forth out of the light of the great causal body of the Great Divine Director. The Great Divine Director continues to sponsor the divine plan for the continent of Africa, even as he sponsors the divine plan for the descendants of Afra in America. Many people have ascended from the black race—although from a spiritual perspective, there is no such thing as the black race or the white race. In heaven, the masters are not noted by their race or previous religion. All of the races on earth have come forth from the heart of God under the seven rays, or seven paths of initiation. Those who are of the “white” race came forth for the mastery of the yellow (wisdom), pink (love) and white (purity) flames—hence, the various mixtures and tone qualities of their skin. These evolutions were intended to place upon the altar of God the gift of their self-mastery in the way of wisdom, love and purity. Those of the yellow race, the people of the land of Chin—or China—serve on the ray of wisdom, while those who have “red” colored skin are intended to amplify the pink flame of divine love. The members of the “black” race have come forth on the blue ray and the violet ray. In an ancient civilization on the continent of Africa, the people’s skin actually had a blue or a violet hue. These colors come from the Father-Mother God, Alpha and Omega, the beginning and the ending, the first ray and the seventh ray. Just as each individual serves on a particular ray, so individual nations also have their calling, or dharma. Each nation is called by God to manifest a specific virtue to fulfill a certain destiny. The members of what is now known as the black race were sent to earth to master the qualities of God’s power, his will and his faith (on the blue ray) and the qualities of God’s freedom, justice and mercy (on the violet ray). Throughout the ages since his departure from Eden, man has wandered from his high estate, and the pure colors of the rainbow rays are no longer reflected either in the skin tone or in the aura. Division has set in through the divide-and-conquer tactics of the fallen ones. Instead of the races embracing one another as brother and sister, there is division: one race enslaves another race, and the great unity of all children of God and their oneness in the flame is destroyed. Afra lived 500,000 years ago when the people of this ancient civilization had reached a crossroad. Fallen angels who had invaded planet Earth divided the people. These evil angels set out to destroy the blue and the violet races. They distorted the once-sacred rituals and art forms of this people, opening the door to witchcraft, voodoo and black magic. They turned the people toward hatred, superstition and a vying for power. As the people began to divert their attention from their God Presence, they became more and more vulnerable to the divide-and-conquer tactics of the fallen angels. The civilization became divided by the warring factions of its tribes. The people were losing the inner spiritual battle between the forces of light and darkness within them. And their division, both within and without, allowed them to become enslaved under the powers of darkness. Seeing the plight of his people, Afra took embodiment among them in order to rescue them. First, he pinpointed the one missing trait that he perceived to be the Achilles’ heel of his people. He identified the point of vulnerability as their lack of brotherhood. Allegorically speaking, they followed the example of Cain rather than following the example of Abel. When the LORD asked the people of Afra if they would be willing to lay down their lives for their kinsmen and friends, their answer was the same as Cain’s: “Am I my brother’s keeper?” The one who answers no to that question is dedicated to his ego. He will never be his brother’s keeper, and eventually the divine spark within him, the threefold flame, will die. Afra knew that many of his people had lost their threefold flame, even as many blacks and whites, through anger, are losing it today. He also knew that in order to regain that flame, they would have to follow a path of brotherhood. They had to care for one another. The only way he could teach them to be a brother to all others was to be a brother to all himself. And for this, he was crucified by his own people. He was the Christ in their midst, but they knew him not. They were blinded by their greed for power. We are brethren because we are of the same Mother. I am your brother, not your lord, not your master. I am your brother on the Path. I have shared your passion for freedom. I have shared with you the hours of crisis when you beheld injustice, when you prayed to the Lord for justice and the Lord gave to you the divine plan for this nation and for this continent. I have lived in your hearts for hundreds of years as you have toiled under the burden of oppression self-imposed from within and put upon from without. The people of Afra have the supreme opportunity to learn from every civilization and every history. When materialization reaches its peak, there are only two courses open to a civilization: either material decline and decay because of indulgence, or spiritual transcendence through the alchemy of the Holy Spirit. In this moment, those who call themselves the blacks of America can rise to new dimensions of freedom and liberty. But this can only come to pass through the mighty heart flame, through the understanding of the path of initiation under the Holy Spirit, through submitting yourself, your soul, to the altar of God and calling upon the Lord for an acceleration of light, a purging of inner darkness. Though there were successes through the civil rights movement, there have been setbacks. For those successes in many instances were outer. Having gained them, the people did not understand that they must go within to the inner light in order to sustain them. We would seek the equality of all souls whatever their outer ‘color.’ We would teach you a spiritual path of true advancement on the path of initiation. Though they know it not, the black people of America today are at the eternal Y. They must choose this day whom they will serve—whether gains in the line of material comfort and increased well-being and higher-paying jobs, or the real gain of the eternal light of Sonship and the path of immortality with all of its challenges. In this land of abundance, it is natural for all people to expect and to live according to a higher standard of living. It is when this higher standard obliterates the inner longing for the higher light and the higher way that it becomes dangerous. I would tell you that God has chosen this people as those who have become rich in Spirit. You can call to Afra for unity and for the dissolving of racial tensions through the true understanding of universal brotherhood. This giant soul with his tremendous devotion was one of the unknown brothers. So long as individuals feel the need to expound upon their own personal achievements, they may well find that they are not truly a part of us. ↑ Elizabeth Clare Prophet, Afra: Brother of Light, pp. 25–26.